Houghton Mifflin Harcourt, 9780544635067, 160pp. In the stillness of his Paris apartment, Jean Daragane has built a life of total solitude. Then a surprising phone call shatters the silence of an unusually hot September, and the threatening voice on the other end of the line leaves Daragane wary but irresistibly curious. Almost at once, he finds himself entangled with a shady gambler and a beautiful, fragile young woman, who draw Daragane into the mystery of a decades-old murder. The investigation will force him to confront the memory of a trauma he had all but buried. 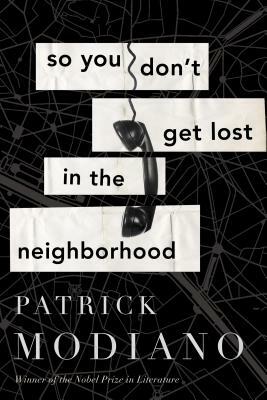 With So You Don’t Get Lost in the Neighborhood Patrick Modiano adds a new chapter to a body of work whose supreme psychological insight and subtle, atmospheric writing have earned him worldwide renown — including the Nobel Prize in Literature. This masterly novel, now translated into twenty languages, penetrates the deepest enigmas of identity and compels us to ask whether we ever know who we truly are.